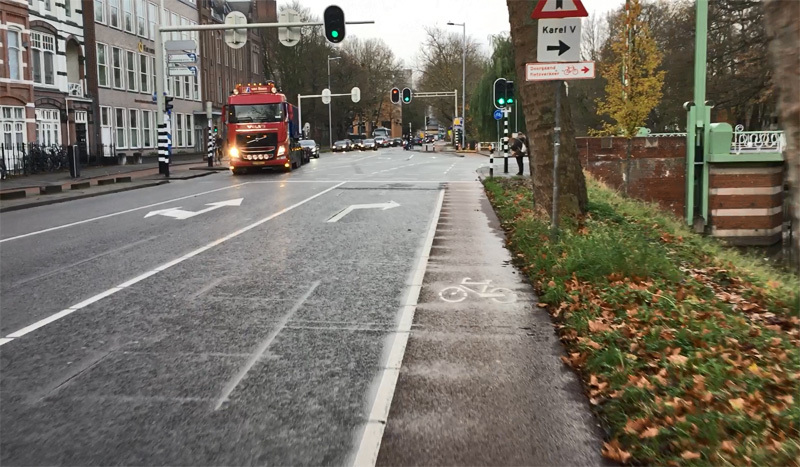 The city of Utrecht reversed a 50-year-old detour for cycling on a main route in the city centre. 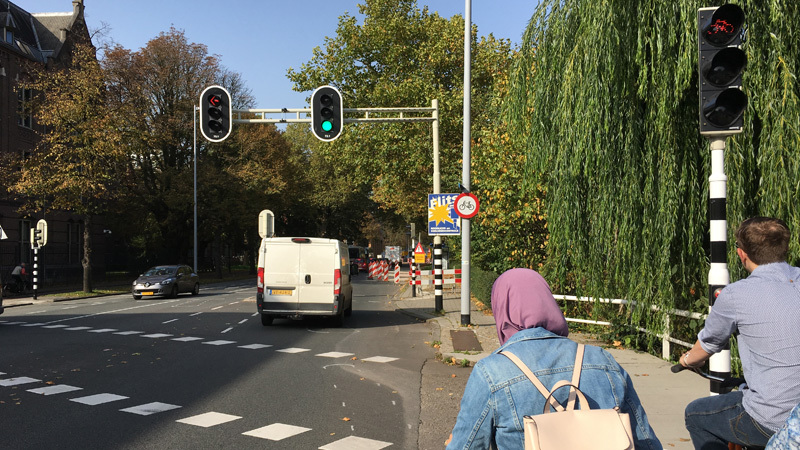 For all that time cycling had been diverted around the shortest motorway in the country, that the city had built in the place of its old city moat. That motorway has gone and the largest part of the city moat has already returned. Now that the last part of that waterway is finally coming back as well, this particular cycle route needed to return to its former location too. After almost 50 years you can cycle straight-on again at this location. This street had been closed to cycling because it became a motorway a little further down. This was the ‘before-situation’. Note the no-entry sign for cycling on the street light pole. (the red circle with the black bicycle on a white field). You could either cycle to the right of this street, on the other side of the water, or on the left hand side, on a two-way cycle track. The current new cycle route looks a lot like the route you could take before everything changed at this location in the late 1960s. 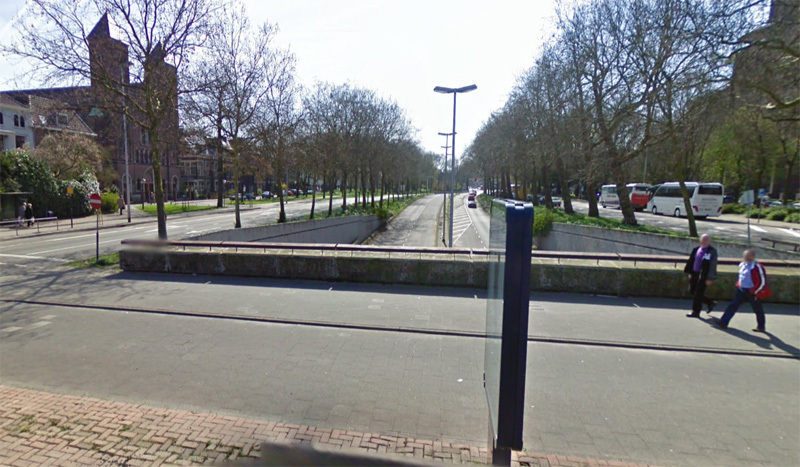 At that time there had been an ordinary street alongside the water without specific cycle infrastructure. The water had slowly disappeared from 1968 on. And since the entrance to the new motorway was right here from the late 1970s. The route for cycling had been relocated. Before the motorway began, and before the water ended, you had to cycle across the moat, to get to the historic city centre side. You would then already be at the inside of the motorway before it had even started. It all made sense with that motorway, but without it there is no reason to cycle through the historic park any longer. When the water returns the city also wants to restore the park to its former self and the cycle route will become a footway again. Exactly as it was planned in the mid-19th century when the ramparts were torn down and converted into this city park. With the cycle route right next to the new water on the outside of it, there is no need to cycle in the park on the inside. The former situation. The first video shows the top route (red line) from right to left. It is clear you had to cross the water to get to the other side of the motorway (on the left) early. The current situation with the new – temporary – route (the blue line). This is the route I cycle in the second video. The route is not entirely straight yet and is sometimes in locations where the water will be. The detour in the park still exists and can also still be used, but it doesn’t make sense any more and it will be changed back to a footway. In the future the street alongside the new water will have cycleways in one direction on either side of the street. Clear and straight. All pictures from the designs made for the city of Utrecht. The red/blue lines are my addition. The new route already looks a lot like the 1960s one, but the new cycleways are still temporary. You can see that by the fact that they are not completely straight yet and some parts even run on locations where the water will have to be. The surface is also temporary with tiles at some places, not asphalt. Considering that the line of trees to the left will be alongside the water (where all the vehicles are), it is clear that the cycle way moved too far to the right here. This cannot be the final location. The same location as the previous picture in 2009 (Google StreetView). This was the actual start of the motorway. Hence all the asphalt. Clearly temporary, this surface of concrete slabs. The current route will have to change again in the two years that the reconstruction of the waterway will take at this location. The people of Utrecht are used to living in a building site, but many also long for this period to end. The elaborate reconstruction of the central station area – that this project is part of too – has started around 2007 and will continue until 2030. 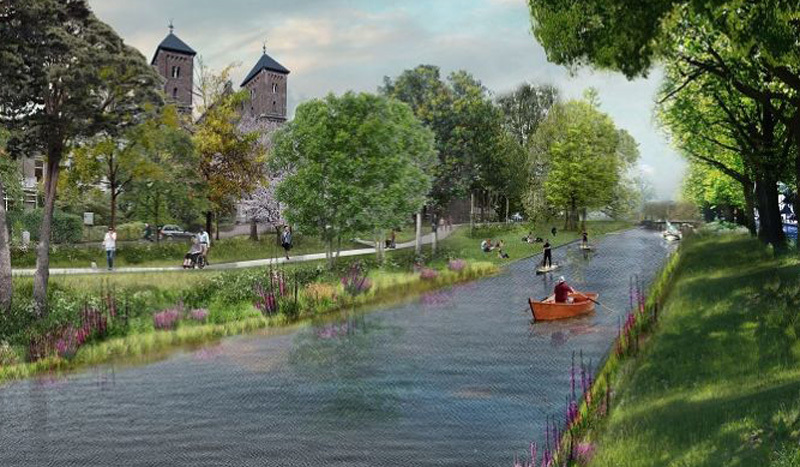 But when this waterway opens, late 2020, the old city moat will have been restored completely and this part of the reconstruction on the east side of the railway will have been finished too. Building activities then shift more to the west side of the station. Picture from the Utrechts Archief showing the former street in 1956. This picture was part of an elaborate traffic counting campaign. 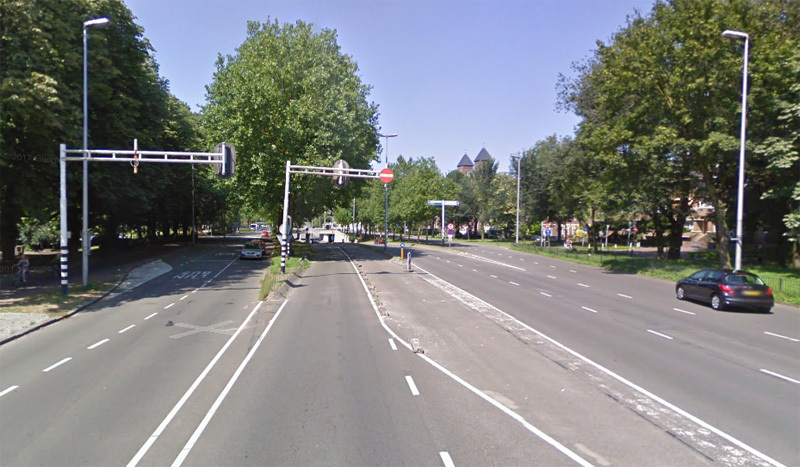 The decision after that count was that much more space was needed for motor traffic in the Utrecht city centre streets. Which is a surprise when you look at this picture! There are far more people cycling than there are vehicles. 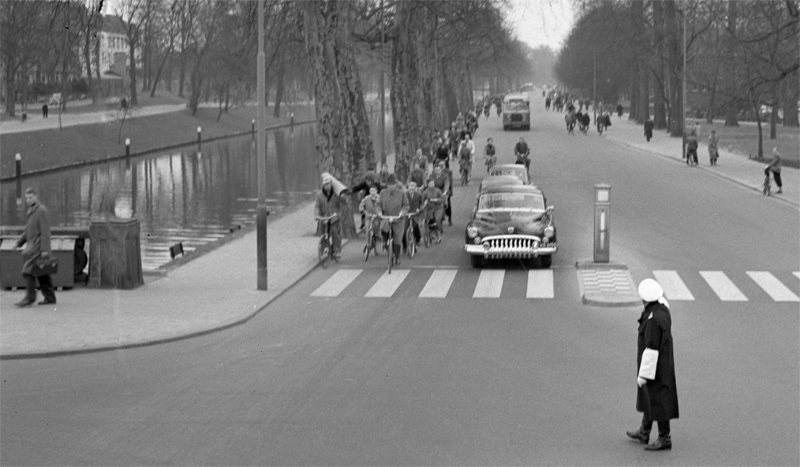 But the authorities at the time wanted to believe that motor traffic had the future and cycling would be a phenomenon of the past. This cross roads (at the beginning of both videos) is not up to current standards. I was happy to read in the plans for the waterway reconstruction that this intersection will be updated too. In the second half of 2018 the last remains of the motorway, part of a viaduct that has temporarily been turned into bicycle parking area, will be demolished. In the course of 2019 the actual reconstruction will then take place. By the end of 2020 it will be possible again for ships to encircle the entire historic city centre. Trees that originally lined the waterway had been alongside the motorway for about 40 years. These same trees will remain standing, but they will be alongside water again. A number of other trees will have to be removed. They had been planted in the filled-in area between the end of the remaining water and the beginning of the motorway. With the return of the water 40 of these trees will have to go. Another 15 can be relocated. To make up for this loss 53 new fully grown trees will be planted. The area will be much greener than it was in the end. And it will be a lot more liveable of course, with that 20th century city motorway finally erased from history! Looking south in 2009 from a viaduct over the motorway. (Google StreetView). This viaduct has not been demolished yet. It is now used for bicycle parking. Video showing the old route through the park. 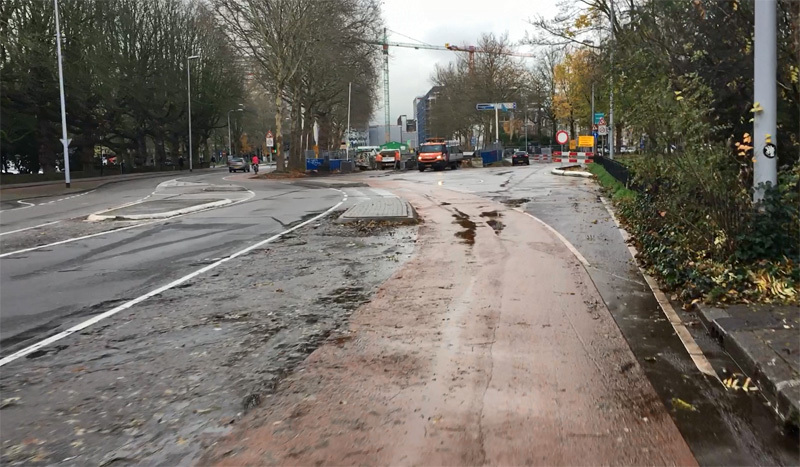 The new – temporary – cycle route alongside the future waterway. In this video I cycle on until the place where the water has already returned. I think that will be a nice improvement. I popped by in the summer while searching for UFOs and thought the painted roundabout looked odd. Great post Mark! 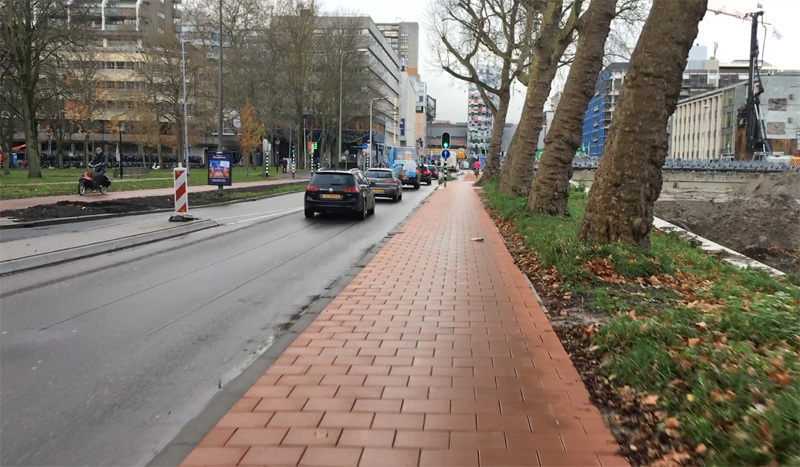 I was cycling southbound this afternoon, and noticed the bidirectional cycle path has been converted to one-way, as the northbound is now on the other side of the road. It seems not everyone noticed yet, 2 people were salmoning. 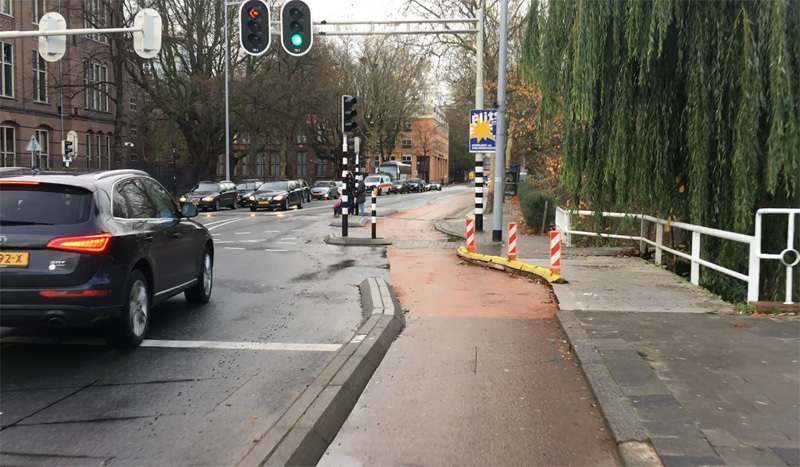 This entry was posted on 13 February 2018 by Bicycle Dutch in Original posts and tagged cycle paths, detour, Utrecht.